Airtel BD Happy New Year Offer 2019 – Airtel Pohela Boishakh Offer 2019! Today, the Airtel Bangladesh brings Boishakhi offer to celebrate the Bangla Happy new year 2018. Under this offer, customers get 1.5GB Regular internet + 1GB 4G internet at only 15 TK. 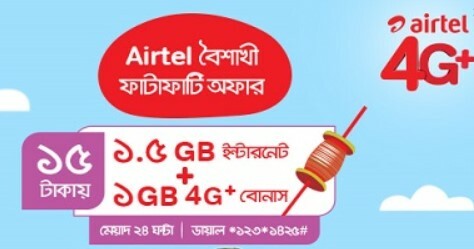 To activate the Airtel BD Pohela Boishakh Offer 2019 – 1.5GB @ 15 TK, just Dial *123*1425#. The Validity of Airtel BD 15 TK 1.5GB internet 24 hours and 1GB 4G Bonus internet offer 15 days. To check the remaining balance of this package, just dial *84444*88#. Customers can activate the Airtel Shuvo Noboborsho Offer 2019 as many times as they want. Airtel Boishakhi Offer 2019 – 1425MB Internet 25 TK Offer! 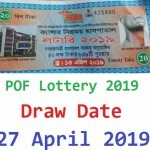 Hello Dear, welcome to Airtel BD Pohela Boishakh Offer 2019 – 1425 MB @ 25 TK. 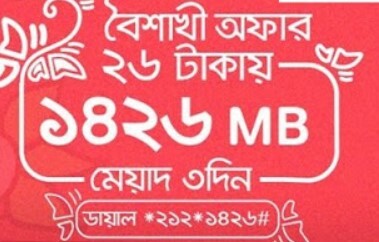 The Bangladeshi user friendly telecommunication company “Airtel Bangladesh” brings a very special internet offer to celebrate the Pohela Boishakh 2019, whose name is Airtel 1425 MB 25 TK Pohela Boishakh Offer 2019. 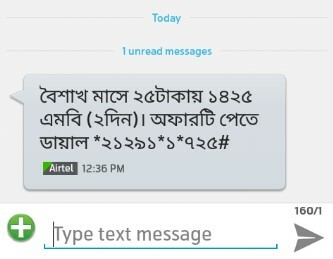 To activate the Airtel Pohela Boishakh Offer 1425MB@25 TK Offer, customers need to dial USSD code *21291*1*725#. The Validity of Airtel BD Boishakhi Offer 1425 MB Internet 2 days and validity starts from offer activation day. To check the remaining balance of Airtel 1425 MB 25 TK Offer, Just dial USSD code *8444*88#. Airtel Pohela Boishakh Offer 2017! In Bangla Happy New Year 2017 Airtel BD brings a new special Offer for their valuable customers name Airtel Pohela Boishakh 2017 Offer 24 MB Internet + 14 Minute Talk-Time Bonus + 1p/sec any local number call rate by recharging exact 24 TK. The recharge amount 24 TK will go customer main account balance. To activate Airtel 24 MB + 14 Minutes Talk-Time (on-net) Free + 1paisa/second call rate any local number Pohela Boishakh Offer 2017, customers need to recharge exact 24 Taka. VAT + SD + SC includes in recharge amount 24 TK. Customers can activate the Airtel BD 24 TK Recharge Pohela Boishakh Offer 2017 as many times as they want during the offer period. The Airtel BD Pohela Boishakh Offer 2017 run until further notice. The validity of 24 TK Recharge Airtel Bangla Happy New Year offer 3 days. To check the remaining balance of Airtel Pohela Boishakh Offer 2017 free Minutes and Internet, just Dial USSD code *778*1424#. Customers use the Pohela Boishakh Airtel Offer free internet and minutes 24 hours. Thanks for staying with us a long time and visiting Airtel Pohela Boishakh Offer 2017 article. If you have any confusion or question or want to know more about the Airtel BD Pohela Boishakh 2017 Offer, Just comment the below box. We reply as soon as possible with a correct answer.